Our parish is in the County of Gloucestershire. It lies three miles to the west of the City of Gloucester and is separated from it by the River Severn. 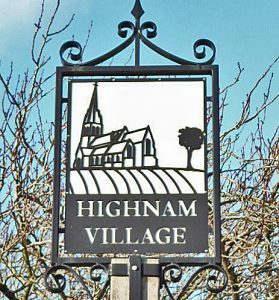 To the north Highnam is bounded by the small River Leadon and to the west by Highnam Woods RSPB nature reserve. The A40 trunk road crosses the parish but the main residential area lies to the north of the B4215 which joins the A40 at Highnam. The population of the parish is approximately two thousand, most of whom live in the housing development of the 1930s and 1980s which are enclosed within a spine road separating the built up areas from the farmland and hills. If you are are visiting Highnam, Holy Innocents Church, built on the Highnam Court Estate in the 1850s by the Gambier Parry family, is in a beautiful location. Both the Church and the Court gardens are open to the public at various times including for events during the summer months.